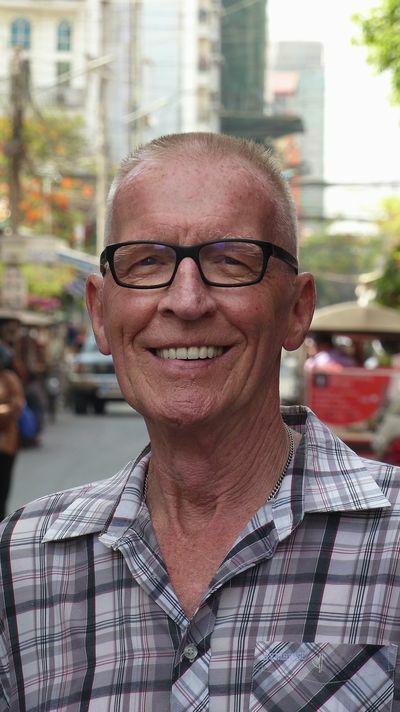 During my travels through Asia I met Charlie (Vin Samnang), a Cambodian doctor who was specialized in HIV / AIDS. He invited me to come over to Cambodia to work as a volunteer. Although I had traveled only a little in Cambodia, I immediately felt attracted to it. As a child I dreamed of and adored the work of Albert Schweitzer. Later I dreamed of working for MSF, but because of family circumstances it never happened. After many wanderings I arrived in Cambodia. With Charlie and his friends / doctors we explored the terrain and the opportunities to support the most vulnerable people. This was where it all began for the establishment of the foundation Empty Hands for Cambodia / Tree for Hope. It turned out that we could fix a bamboo hut with walls and a roof of palm leaves for about $80. Every community had to help with the repair, and for each one of them we composed a “survival kit”. Each helper got a mosquito net, blanket, soap, toothbrush and toothpaste, 2 packets of noodles and three cans of fish. And for the children the unavoidable handful of sweets. I spent one month in Cambodia, was introduced to many people and could choose which activities suited me. After this experience and the feeling of being in a warm bath, I decided to go back and continue the “work”. It seemed that most success would be achieved in the direct contact with the locals, seeing where help was needed, buying the necessary materials together with the locals, letting the huts be built by the community and then to see how it grew from there. Apart from that I came to the conclusion that I wanted to maintain this form and not be registered in the system, in order to stay out of all the corruption. This has become a basic code for the next visits which became more intense and successful. Also, thanks to various organizations and individuals, we got more donations and assistance. Thanks to the many generous donors the need arose for a foundation with an Anbi (a hallmark for charities provided by the IRS making donations tax deductible) and a special bank account at the Triodos Bank. This process has continued until now and more and more people / organizations join, commit themselves, and visit the projects in Cambodia. Every year I stay in Cambodia for six months with great pleasure, I visit the local organizations with which we work, and try as much as possible to build bridges and to transfer responsibilities to the local population.